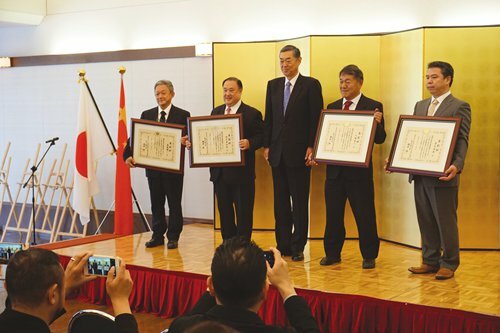 Four Japanese working in the food sector in China received special awards from Yutaka Yokoi, Japanese Ambassador to China at his residence in Beijing on Tuesday. Award winners included Haneda Yukihide, consultant for Japanese food company House Foods China Inc, Kobayashi Kinji, honorary director of the Japanese chef's club in Beijing, and Takahashi Youichi and Fukaya Hiroyasu: both directors of the Japanese chef's club in Beijing. In Ambassador Yokoi's welcoming address, he noted this year marks the 40th anniversary of the signing of the Treaty of Peace and Friendship between Japan and the People's Republic of China and it was a great pleasure for him to host the awards at a time when Sino-Japanese relations have greatly improved and developed. "In recent years, Japanese restaurants have rapidly become popular, with more than 40,000 opening in China, ranking first in the world. These four winners are among those who have been active in contributing to Japanese food culture in China for years," Yokoi said.